Mice whose brains had lost a large number of neurons due to neurodegeneration regained long-term memories and the ability to learn after their surroundings were enriched with toys and other sensory stimuli, according to new studies by Howard Hughes Medical Institute researchers. The scientists were able to achieve the same results when they treated the mice with a specific type of drug that encourages neuronal growth. By giving ordinary adult mice a drug – a synthetic designed to mimic fat – Salk Institute scientist Dr. Ronald M. Evans is now able to chemically switch on PPAR-d, the master regulator that controls the ability of cells to burn fat. Even when the mice are not active, turning on the chemical switch activates the same fat-burning process that occurs during exercise. 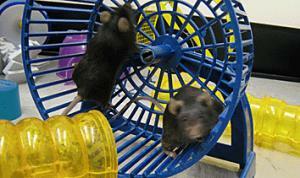 The resulting shift in energy balance (calories in, calories burned) makes the mice resistant to weight gain on a high fat diet. Hopkins researchers have identified a backup supply of stem cells that can repair the most severe damage to the nerves responsible for our sense of smell. These reservists normally lie around and do nothing, but when neighboring cells die, the scientists say, the stem cells jump into action. A report on the discovery will appear online next week in Nature Neuroscience. A relative of the anti-aging gene Klotho helps activate a hormone that can lower blood glucose levels in fat cells of mice, making it a novel target for developing drugs to treat human obesity and diabetes, UT Southwestern Medical Center researchers have found. Dr. Makoto Kuro-o, associate professor of pathology, has reported that a relative of the anti-aging gene Klotho helps activate a hormone that can lower blood glucose levels in fat cells of mice. This discovery of a particular type of Klotho protein could eventually make it a novel target for developing drugs to treat human obesity and diabetes. Researchers are adding to the list of cancer types for which pomegranates seem to halt growth. A recent study at the University of Wisconsin–Madison using a mouse model shows that consuming pomegranates could potentially help reduce the growth and spread of lung cancer cells or even prevent lung cancer from developing. In the most comprehensive look at genetic risk factors for type 2 diabetes to date, a U.S.-Finnish team, working in close collaboration with two other groups, has identified at least four new genetic variants associated with increased risk of diabetes and confirmed existence of another six. The findings of the three groups, published in the journal Science, boost to at least 10 the number of genetic variants confidently associated with increased susceptibility to type 2 diabetes — a disease that affects more than 200 million people worldwide. A naturally occurring compound found in many fruits and vegetables as well as red wine, selectively kills leukemia cells in culture while showing no discernible toxicity against healthy cells, according to a study by researchers at the University of Pittsburgh School of Medicine. These findings, which were published online March 20 in the Journal of Biological Chemistry and will be in press on May 4, offer hope for a more selective, less toxic therapy for leukemia. How Can a Genetic Mutation Cause Muscle to Turn into Bone?